Publication: July 28th 2014 by Createspace. This is a story that really is about the Not Yet’s in life. This is a story of a girl, Emma, who has never met her father. He ran off when her mother was pregnant with her, worried that this child might also have special needs like her sister, Evie. She finished college quickly and is working as a life guard while waiting to find a teaching position. Emma has a series of life’s lessons and the book shows each lesson as it occurs. She doesn’t trust men much since there hasn’t been one in her life. Her sister, Evie means everything to her and helps her mom with Evie. Evie is sweet and kind and likes to cuss. While waiting for a teaching position, Emma becomes a life guard and manages the pool for the summer. There she meets Landon. He is kind and a little cocky. He falls for Emma quickly and Emma tries to fight it but she falls for him too. Landon tells her he is in college playing football. Throughout the summer, they get to know each other and Landon learns a lot from Emma, like how to help kids with special needs and Landon, Landon, Landon; well that boy starts becoming a man here with the way he learns to be around kids with special needs and helps them. And Emma can’t deny how much that means to her and how he is there for her and her family. When Evie wants to move in with her boyfriend, Emma doesn’t exactly know what to say. She isn’t ready for that. 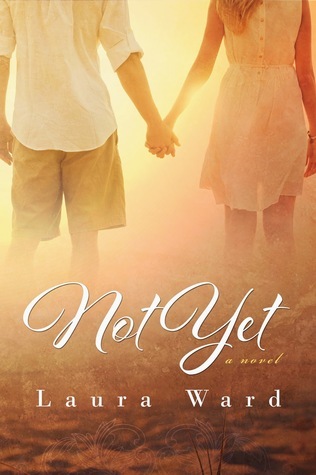 But Landon tells her that maybe they will move in but maybe “Not Yet” is his answer to the problem. End of the summer comes and Emma gets a job teaching in high school. She is nervous to teach kids close to her age. Landon texts her to tell her he needs to talk with her. But they aren’t able to talk. From here on the story goes from them being in love to being maybe not yet. When the story turns to maybe not yet, I was hesitant to read anymore. The idea of what happened bothered me a lot. But I continued and watched them both struggle with things and both grow. Landon became really good with special needs. That was why I really liked him. He wasn’t shallow. He was maturing. Emma enjoyed her teaching and even had one girl, Amy, who also had special needs as her assistant. She was sweet and very positive and really added something incredibly endearing to the story. The chemistry between Emma and Landon was sweet and not over the top. The story of helping people with needs is what clenched me and not so much the relationship between Emma and Landon. There aren’t a lot of stories with romance built in and learning how to treat people much less people with needs. That is where Landon found his calling in life, I believe anyway. So if you like stories of families who really care about each other and do whatever they can to help their family member who have needs succeed in life, doing what is right, being patient , very very patient, showing bullies to stop it, learning how to trust again, enduring to the end then this story might be for you. I have the paperback version of this on my Amazon wishlist. I saw it one day and it was the cover that caught my eye. I read the blurb and thought it sounded pretty good.